Form 15G or Form 15H are the declaration forms by the assessee stating that no tax is payable by them and thus no TDS should be deducted from payments to them. The form can also be submitted through electronic process and it is mandatory for the payer to accept the electronic generated form. The payer has then to verify the details of the declarant and he is responsible for to establish the identity and credentials of the declarant in any dispute. Sequence number shall be reset to 1 at start of each financial year. And also the forms received in paper format is to be ditized and such ditized copy is to be uploaded to portal. Furnishing particulars of declaration in TDS return of such quarter. To file the “Statement of Form 15G/15H”, user should hold valid TAN and should be registered as “Tax Deductor & Collector”. If not already registered, he should Go to Register yourself- >Tax Deductor & Collector and complete the registration process. 1) Download FORM 15G/15H utility from Downloads page > Forms (Other than ITR) >FORM 15G/FORM 15H (Consolidated) and prepare the xml zip file. 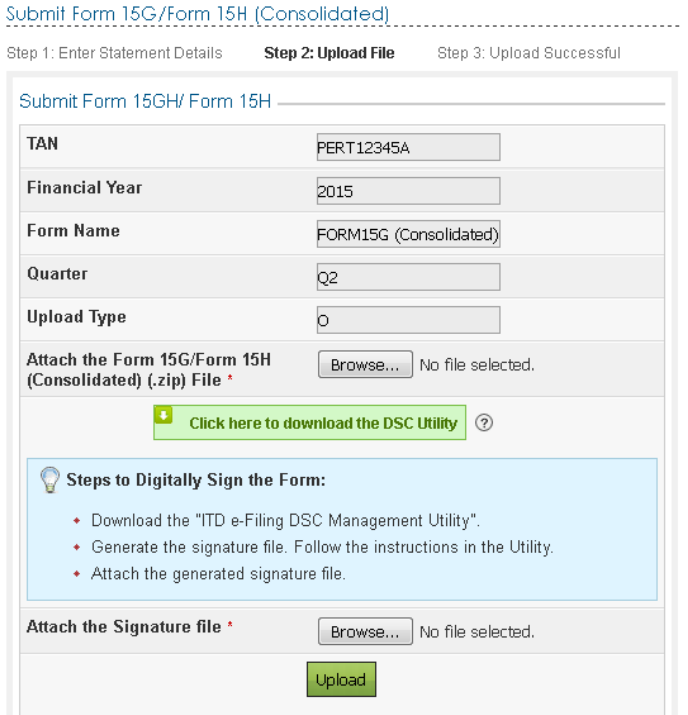 2) DSC is Mandatory to file FORM 15G/15H. 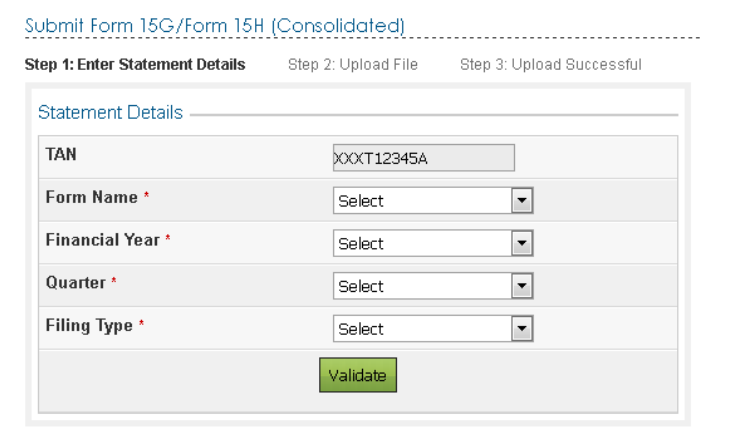 4) Login through TAN, Go to e-File -> Upload Form 15G/15H. Enter the details Form Name, Financial year, Quarter and the Filing type. 5) Upload the “Zip” file along with the signature file. Zip file and signature file can be generated from the DSC Management Utility. 6) On successful upload, the following screen is displayed. To view the status of uploaded file, Go to My account >> View Form 15G/15H. Once uploaded the status of the statement shall be “Uploaded”. The uploaded file shall be processed and validated. Upon validation the status shall be either “Accepted” or “Rejected” which will reflect within 24 hours from the time of upload. Accepted statements shall be sent to CPC-TDS for further processing. In case if “Rejected”, the rejection reason shall be available and the corrected statement can be uploaded. Below are the list of validations carried out on the uploaded statements. Only one original will be accepted for combination of TAN, Financial Year, Form and quarter. TAN, Filing Type, Quarter and Financial Year entered in XML should match with the TAN, Quarter, Financial Year and Filing Type in upload screen. 2. Furnishing particulars of declaration in TDS return of such quarter. The person shall furnish the particulars of declarations received by him during the quarter along with the unique identification number alloted by him in TDS return of such quarter. TDS return is to be filed along with required information, even if there is no tax deducted in the said quarter. The UIN shall be same which is used for uploading the forms. The payer shall file exceptional report for the UINs not reported in TDS return or not uploaded on Income Tax Department website. The payer is required to keep Forms 15G/15H with him for a period of 7 years from the end of the financial year in which such forms are received. Income tax authority may ask for these forms for verification.